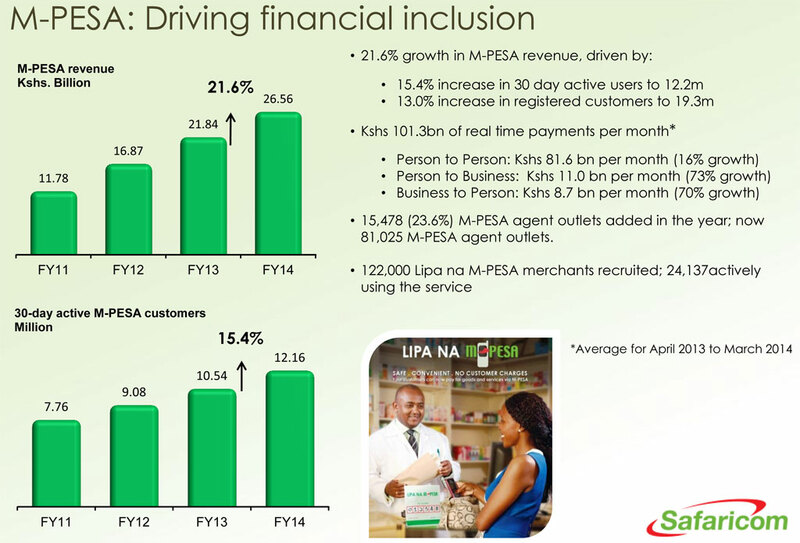 Kenyan mobile network operator Safaricom has now signed up 122,000 merchants for Lipa na M-Pesa, a service launched in June 2013 that enables Kenyan consumers to use the funds stored in their M-Pesa mobile money account to pay for goods in stores. Of the merchants signed up, just under 20% (24,137) are using the service today, Safaricom revealed in its financial report for the year ended 31 March 2014. To make an in-store purchase using the service, customers select the ‘buy goods’ option from the payments services section on their mobile phone’s M-Pesa menu and then enter the till number of the merchant they wish to pay. Both the merchant and the customer get confirmation messages from M-Pesa when the transaction has been completed. Overall, Safaricom’s revenues from M-Pesa grew 21.6% during the year to Ksh26.6bn (US$303m) and the number of customers registered for the service increased by 13% to 19.3million. Some 56% of Safaricom customers now use the service at least once a month and transactions worth Ksh101.3bn (US$1.1bn) are now conducted each month. Person-to-person transactions account for Ksh81.6bn of this total, up 16%; person-to-business accounts for Ksh11bn monthly, up 73%; and business-to-person transactions account for Ksh8.7bn, up 70%. Safaricom now also has 3.6million active customers for its M-Shwari savings and loans service, the carrier says.